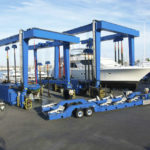 Travel lift for sale is an ideal boat handling equipment to accelerate the operation and production of harbors, docks and shipyards as well as to perform the lift-in, lift-out and transportation of vessels in yacht clubs, water recreation center and navy. 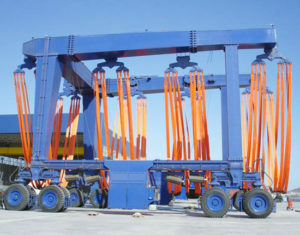 Our travelift is capable of lifting a substantial amount of weight, usually in a range of 10 tons to 1200 tons. 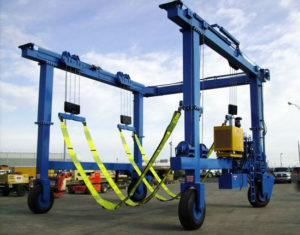 To meet your heavier lifting needs or special requirements, the travel lift crane can be custom designed in height and width. 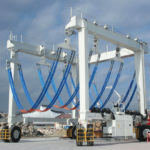 Our travel lift for sale is available in multiple models and configurations to undertake different tasks of handling ships. 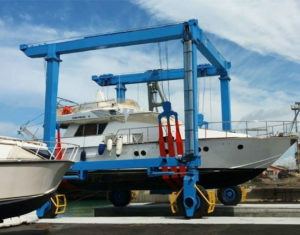 One the one hand, it performs the basic function of lifting large tonnage boats in and out of the water, on the other hand, it can transport these vessels with ease to implement different works in the yard, such as the maintenance and repairing of boats. 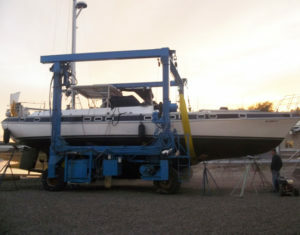 It is also used to arrange the boats in rows so as to save the yard space. 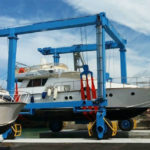 In regards to the sort of vessels to be hauled, the travellift has yacht travel lift, sailboat lift, fishing boat lift, patrol boat hoist and powerboat lift for you to choose from. 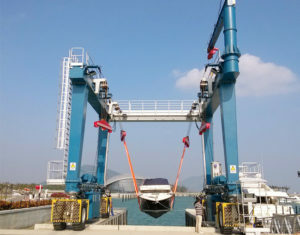 According to the drive mode, the travel lift for sale can be classified into hydraulic hoist lift and electric boat lift. 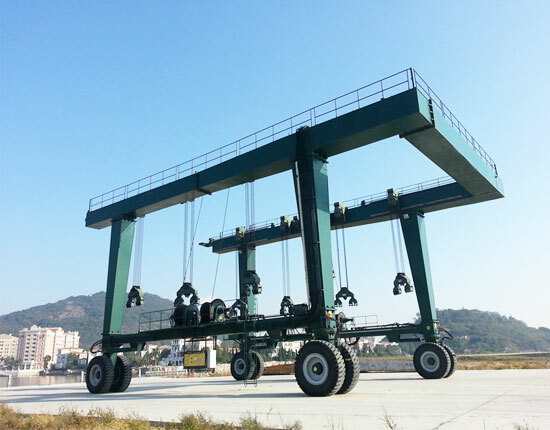 Typically, our travel lift for sale adopts full hydraulic drive. 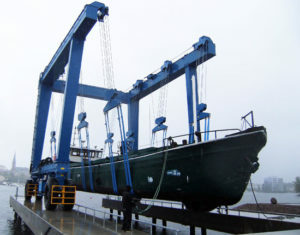 In the cases of small tonnage boats handling, however, we can design a cost-effective electric drive mode on request. The travel lifts are generally operated by means of remote control and cabin control. The control system will be configured for your requirements. 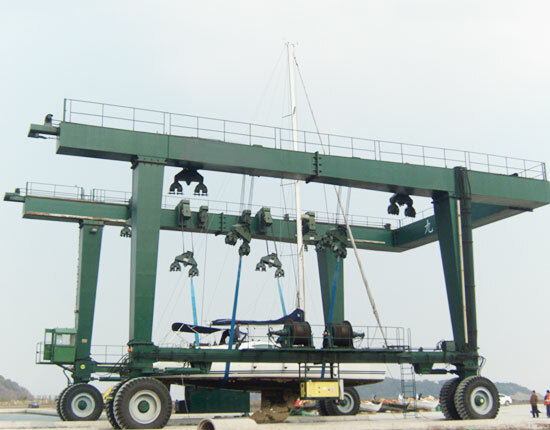 The travel hoist will greatly improve efficiency for the dock operation since it can undertake the heavy-duty work in a safe and fast way. The rigid structure offers reduced fatigue and a longer working life. 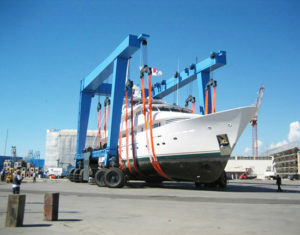 The hoist lift will cause little damage to the hull and it can balance the load equally. 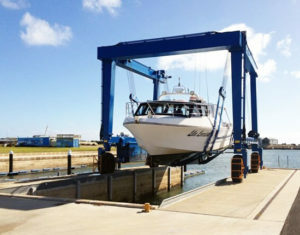 The boat lift can be easily reconfigured in dimension through the use of bolting flange in order to fit different sizes of vessels. 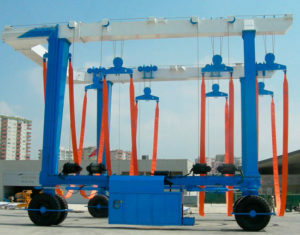 The travel lift for sale supplied by Ellsen has good quality and low cost. 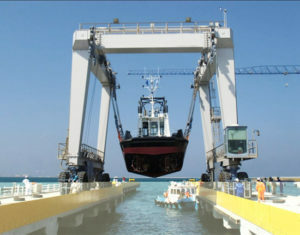 With soft but sturdy slings positioned underneath, the crane will cause little damage to the hull surface and structure. Operation mode: remote control, cabin control or the combination of the two modes. Travelling and steering mode: straight travelling, oblique travelling, fixed axle steering, 90 degree steering, etc. 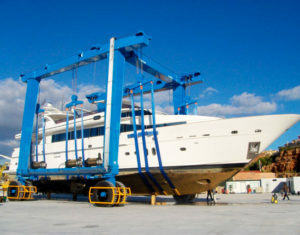 The steering system offers precision steering control for boat handling. Maximum slop when travelling with full load: 4%. 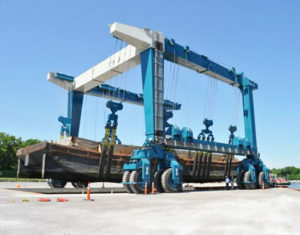 Variable-span boat lift crane is available to fit different widths of vessels. 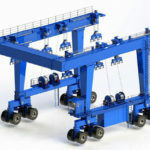 The upper structure is a double gantry U-shaped frame that is articulated together to eliminate structural stress when travelling on uneven ground. 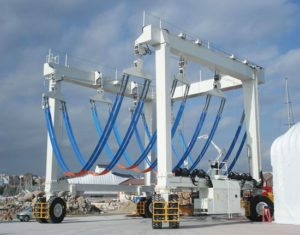 The hoisting mechanism uses load-sensitive hydraulic system. The lifting points can be adjusted to keep a synchronous lifting, and at the same time, to output power according to the load condition. 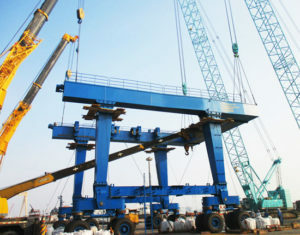 In this way, the energy consumption of the entire crane can be reduced. 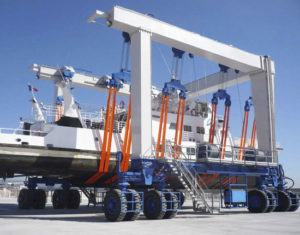 The travel lift crane is composed by a few major components and units, including the crane metal structure, wheel groups, travel lift winch, lifting points, electrical system and hydraulic system. 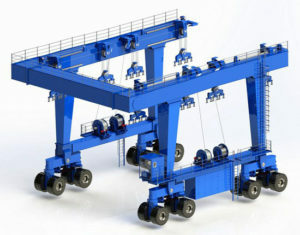 The metal structure comes in articulated double gantry U frame with solid and robust construction. The wheel group consists of industrial tires, wheel hub, motor, reducer, steering cylinder, wheel frame and so on. 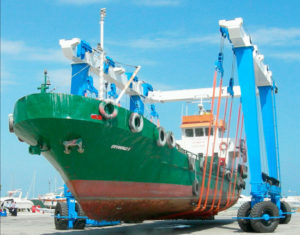 Travel lift winch mainly consists of lifting motor, reducer, wire rope, brake, balance valve and metal structure. 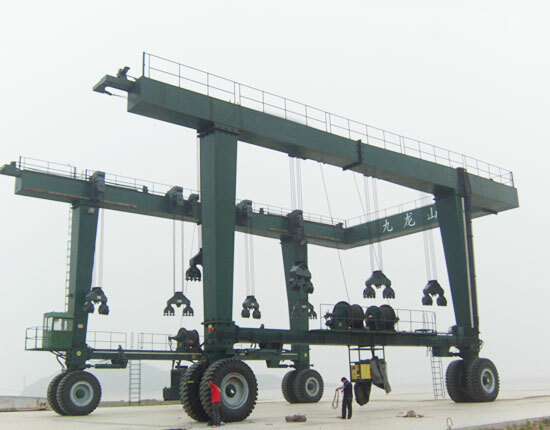 The lifting points are composed of pulley, slings, chain and gear motor. The hydraulic system consists of a few main units, including diesel engine, diesel tank, silencer, hydraulic pump, hydraulic tank, filter and hydraulic accessories. The electrical system is composed of auxiliary engine, limit switch, over-speed switch, relay, contactor, air switch, wire and cable, electrical accessories, wireless remote control or driver’s cabin. 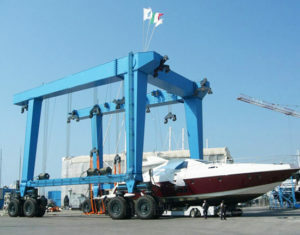 To know more details and travel lift configuration, contact us today! Check the engine oil level and fuel level before staring and the oil pressure after starting. 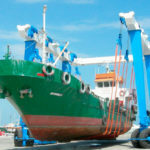 Check the travel lift slings to make sure they are in working conditions. Check the wire cable to make sure it is not frayed or kinked. Make sure the tires are properly inflated. Make sure the hydraulic separation cylinders are synchronized. Check the strap pins and steering wheels. 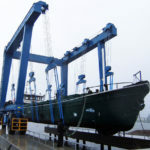 With respect to the tonnage and dimension of vessels, the working occasions and environmental conditions, the marina travel lift for sale comes in various designs and configurations to complete the vessel handling work. 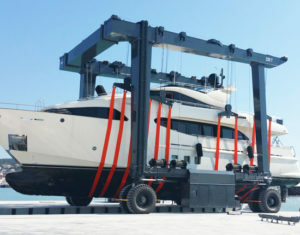 The travel lift is a perfect choice since it offers sufficient power to haul a boat and ensures safety for boats and staff. 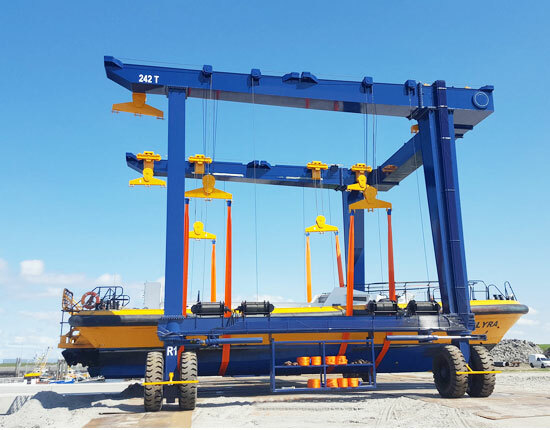 According to the lifting capacity, we have an array of cranes for sale, such as 15 ton, 50 ton, 100 ton, 200 ton and 500 ton travel lift for sale. 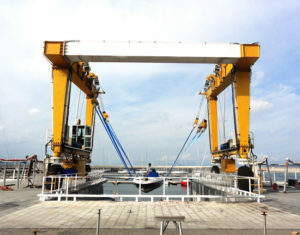 The maximum capacity normally reaches up to 1200 tons. 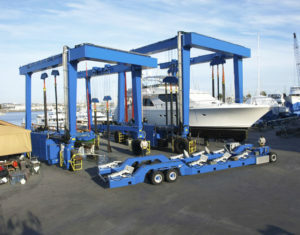 To get a suitable and affordable solution, please tell us your specific requirements, such as the boat weight and size as well as the size of a specifically designed wharf. 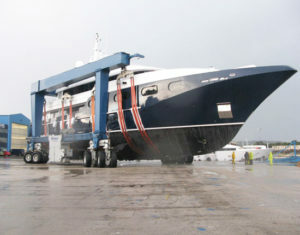 The travel lift will be tailored for your individual needs. Want to get the best deal? contact Ellsen now! 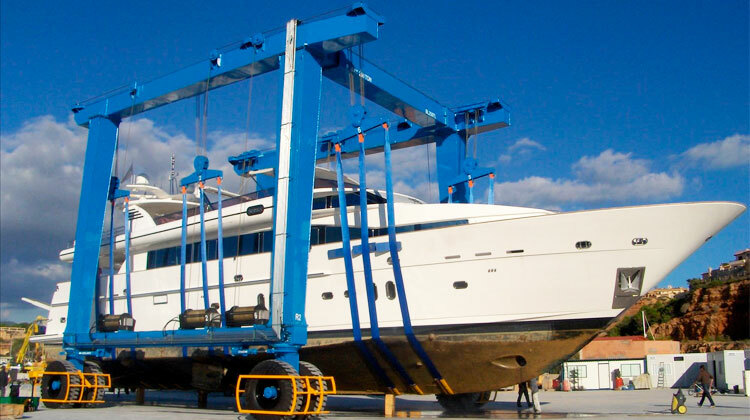 The travel lift manufacturer is an essential part in the selection process of yacht travel lift since a reliable and reputable manufacturer will create the maximum value for your business. Here are some points to consider when choosing travel lift suppliers: the qualification and authentication of these manufactures, their industry experience, track record, service and so on. 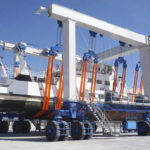 We provide a variety of solutions for lifting, from overhead crane, gantry crane, jib crane to construction winch, marine winch and travel lift. Engaged in the material handling industry for more than 10 years, we are constantly growing and developing through offering quality products and dependable services to clients. The principle of quality first and customer foremost always comes to the core of our business operation. So you can buy our travel lifts with confidence. Need a travel lift? Contact us directly. You have the problem, and we have the solution!